This is a four-hour meeting held on site with the Homeowners. The Designer measures the property and then working together we create a quick sketch design from which you will be able to organize and implement your garden plan. 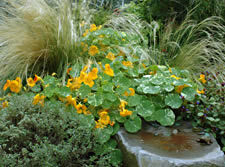 For more tips about how to implement your gardening plan see my HOMEOWNERS INSTALLATION REMINDERS. Payment for this quick-design service — which usually lasts about four hours — is due at the end of the meeting.